High-quality robot components can be found in factory automation, deep space, and a tech frontier that’s just as challenging — the home. As we discussed at RoboBusiness 2017 late last month in Santa Clara, Calif., precision drives are necessary ingredients for successful, robust robotics products. In the video below, Doug Olson, president and CEO of Harmonic Drive LLC, talks with Robotics Business Review about how the entire robotics industry uses his company’s strain-wave gears. He describes Harmonic Drive’s robot components as the “paint” that enables automation suppliers and end users to “paint a Rembrandt” in terms of performance and applications. Some examples include collaborative robots and a prototype of an arm that Motiv Space Systems is building for the Mars 2020 mission [see image above], according to Olson. Although Harmonic Drive has been making precision parts since 1960, automation has blossomed in recent years, thanks to cheaper and better processing, sensors, and artificial intelligence. Olson notes that Harmonic Drive now supplies robot components for semiconductor manufacturing, surgical robotics, laboratory automation, and spaceflight. Consumer and household robots have yet to mature, but Olson agrees that the demographics of aging populations should lead to even higher demand in the future. Harmonic Drive’s experience with commercial robotics also makes it an excellent partner for customization, Olson says. The company’s decades of experience are also reflected in its third-annual C. Walton Musser networking event at RoboBusiness. Musser was a prolific inventor and founder of Harmonic Drive, and he would have been pleased to see the entire robotics and AI ecosystem coming together, explains Olson. 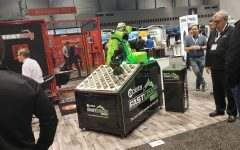 In addition, Olson observes other key takeaways from this year’s RoboBusiness, including the Market Forecast by ABI Research’s Dan Kara, which predicted continued industry growth. To that end, Harmonic Drive plans to increase its production from 95,000 units per month now to 115,000 per month by early 2018 and 400,000 per month by 2020. The company is investing $300 million in the expansion, including new plants in Japan and Massachusetts. “The best is yet to come!” says Olson about the market’s bright prospects.